When it comes to a good face scrub, I can go either way on pre-mixed or dry formulas. 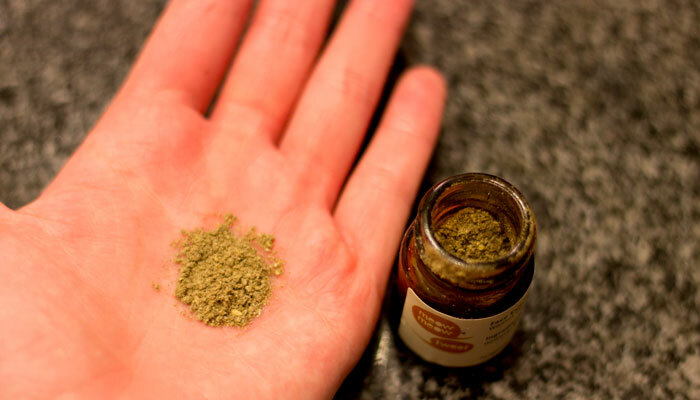 Typically, I like to exfoliate a couple times a week during my shower, so pre-mixed makes sense, but for evening spa nights when I’m really taking my time, a powder, mix-it-yourself scrub is fun to whip up and apply. 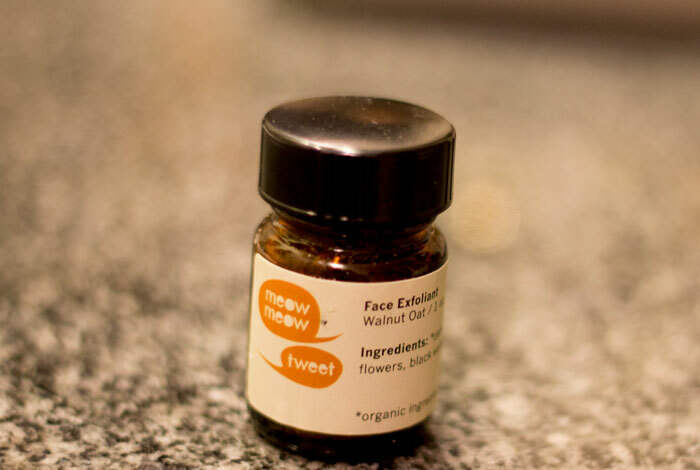 One powder face scrub I’ve been using lately is Meow Meow Tweet’s Face Exfoliant, which is made with just four simple ingredients. Oats, chamomile flowers, black walnut hull and kelp make up this natural face scrub and create an earthy aromatic experience that you will either love or hate depending on your nose’s preferences. I personally find the scent soothing and intriguing; it reminds me of — bear with me — a pet store … but not in a gross way. In an oddly comforting way. It’s definitely the oats and black walnut hull that dominate the scent profile of Meow Meow Tweet’s Face Exfoliant. If you’re not an earthy / herbal scent kind of person, this probably isn’t for you. If you’ve got a nice collection of essential oils, you might consider adding a few drops of your favorite to your mix to soften the scent (I like rose). Beyond the scent, which I know is very personal for everyone, the texture of Meow Meow Tweet’s Face Exfoliant is extremely gentle. The natural oats and walnuts don’t overstimulate your skin, yet are enough to reawaken your glow and prep your skin for your favorite toner and face oil. To get a massage-like effect during your scrub down with Meow Meow Tweet’s Face Exfoliant, mix it up with your favorite carrier oil (jojoba and coconut are two of my favorites) to give it a bit more slip and lasting power compared to water. While Meow Meow Tweet’s Face Exfoliant isn’t one that I’ll repurchase (scent is a big draw for me), I do like the idea of having a more rugged skincare product in my arsenal. I could see myself tossing this into my bag for some sort of outdoorsy weekend trip; it would definitely fit in on a campground or for a break during a very long hike. What, you don’t exfoliate when you go hiking? I’ll be bringing you a few more Meow Meow Tweet reviews soon — there’s a standout product in the collection that I’m extremely smitten with and can’t wait to share with you! What do you look for in a face exfoliator? Have you tried anything from Meow Meow Tweet? Tell me in the comments section!